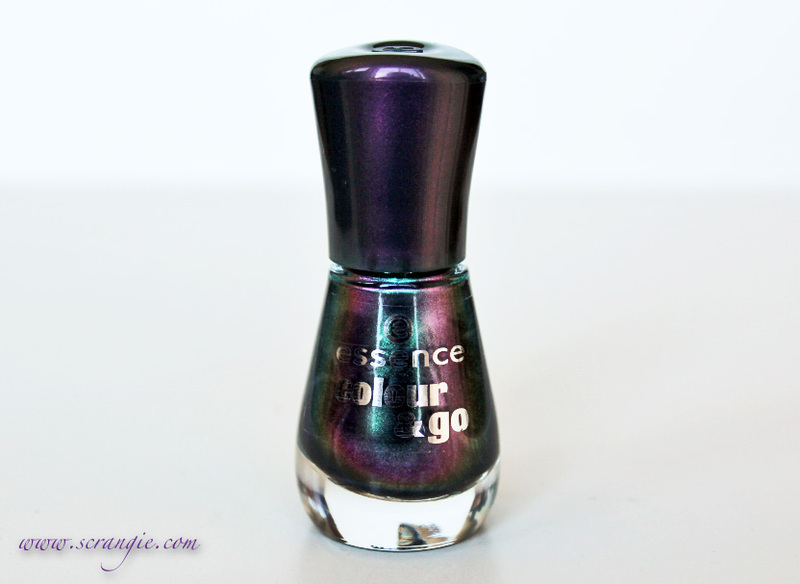 Did you know that Essence Colour & Go polishes recently received a bottle makeover? It's true. They went from a straight-sided circular bottle to a new hourglass shaped bottle. 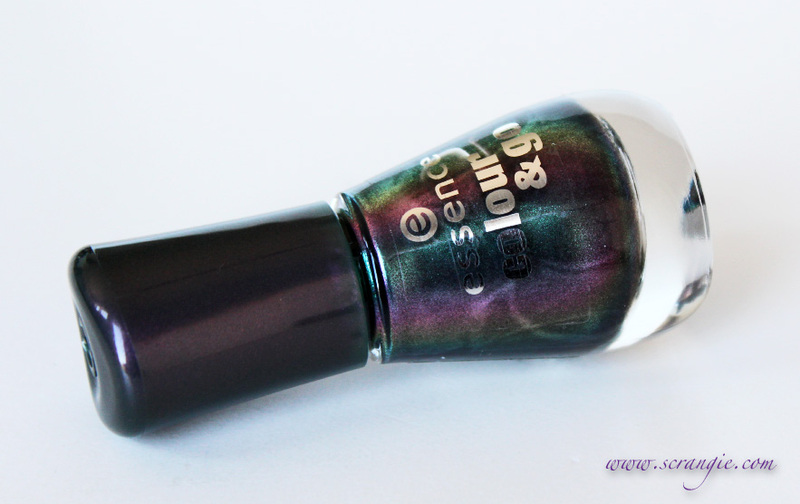 Ulta had some of the new-style Essence polishes in stock and this one really caught my eye- A multichrome! With purple and green! It's called Chic Reloaded. 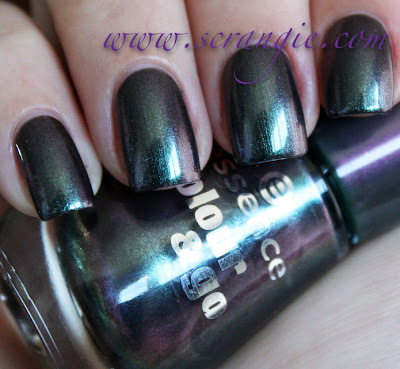 Essence Colour & Go in Chic Reloaded. This is a dark grey shimmer base with strong teal, blue, green, purple, red/dark pink and gold multichrome color shift. It's really tricky trying to catch all the different colors on camera because the polish is so dark, but I sure tried! You can see them quite clearly in the bottle and they're only slightly less subtle on the nail. The strongest colors are the blue and teal at one angle and the purple and grey at the opposite angle. The red and gold come out on the purple side, but they're not as strong as the other colors. The formula on this was pretty good. The only problem I had with it was bubbling. It seemed to bubble despite waiting at least 5 minutes in between coats. It dries pretty quickly, so next time I wear it I'll let the coats dry fully before applying the next one to see if it eliminates the bubbling. I love this color. Kinda reminds me of Borghese Stellare Notte and GOSH Purple Heart. 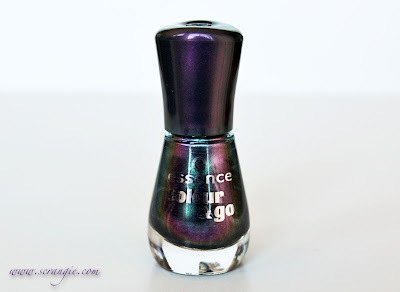 Great color shift, decent formula, and I am really very fond of color-matched handles on nail polish bottles, but the best thing about this polish is that it only costs $2! These haven't shown up yet at my local Ulta, but what's the volume on the polish compared to the old bottles? Love this color too. 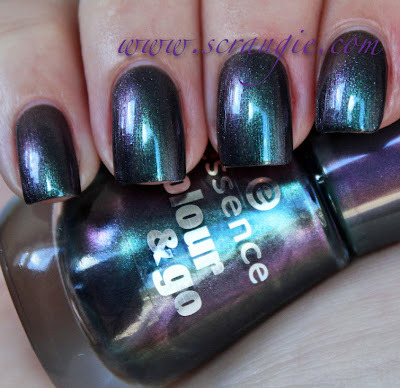 I just saw this gorgeous polish at my grocery store this morning!Now that I've seen your swatch,I will have to pick it up tomorrow.My gosh,Scrangie,it's so pretty! This is gorgeous, I hope my local Ulta will have it! I had to get this one too, it was calling my name! Great swatch! That! is one pretty and unique color. $2 bucks, too. Thanks for posting it! Pretty nails, btw. They didn't just change the bottles. They changed the formula as well. The new formula bubbles, it chips easier and doesn't last as long. But there is more product in the bottle. I'm disappointed with the 2 new ones I picked up. I used 1 coat over Essie Groovy Grape and it looks frigging wicked and it dried like lightning with 0 bubbling. I layered it over SV though as the GG was a pre-existing mani so maybe that made a difference. Either way it rings my bell. Love to have opaque-ish standbyes for layering! Gorgeous and for 2 bucks it seems like a steal! This reminds me somewhat of how MAC Formidable looks layered over a black, but less red. 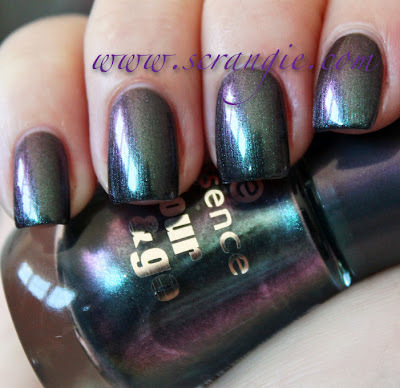 I bought 5 essence polishes on my last trip to Ulta and this was one of them. Love the new bottles and brushes and just like u said u can't beat the price. This is a really nice one from essence!!! What color so cool! I wished that we reach these new glazes to Spain to me with this (and surely some more). Looks like a better version of Sally Hansen Black Tie. 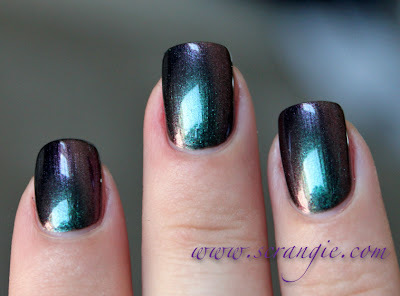 Black Tie looks so pretty in the bottle but on the nail it loses most of the multichrome effect. I love this polish. I love the green that shifts into pink/purple. But you do see the blue! No matter how much I moved around with my fingers (I must have looked like an idiot) I never saw the blue. 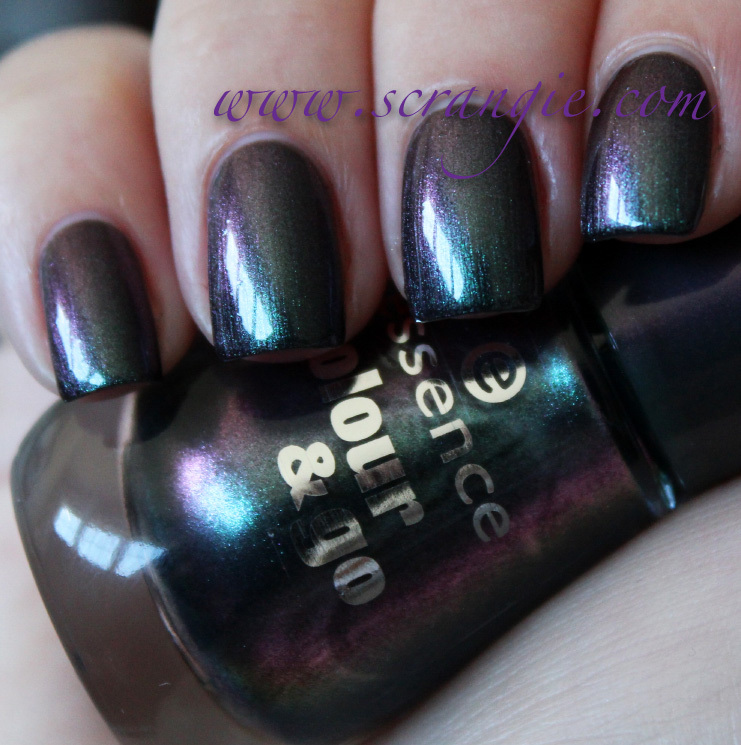 Do you know if this is the same as Essence Where is the Party? Cause it looks so similar. If so, it would be a close dupe of Zoya Juno. Awesome, I'm gonna keep an eye out for this one next time I go to Ulta! gorgeous color, looks like an oil slick! This is a gorgeous color! I worry about the bubbling, though. I wish they were more readily available in the U.K. Great shade. Oooh, so pretty! I'll have to see if my Ulta has this one. I found an Ulta which I did not know we had. I ran right over and they do not have this in stock yet. Duh, I guess I could have called them first. Thanks for all of your hard work Scrangie! pretty! i hope my local drugstores brings this one in!